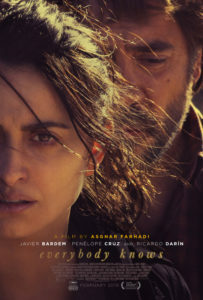 Starring Penelope Cruz, Javier Bardem, Ricardo Darín, Bárbara Lennie, Ramón Barea, Inma Cuesta, Elvira Mínguez, José Ángel Egido and Carla Campra. When a teenage girl goes missing during the frivolities of a wedding reception, family and friends discover buried secrets and unspoken turmoil as they try to reunite the family. Asghar Farhadi is one of the most celebrated directors of cinema not in the English language. 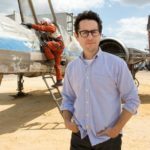 Two of his recent films – A Separation and The Salesman – won Oscars and he hit the headlines in 2017 when it was revealed that Donald Trump’s travel ban might prevent him from attending the Academy Awards. He ultimately chose not to go of his own accord. People are certainly talking about Farhadi and many were waiting with excitement for his next project. That project is last year’s Cannes opener Everybody Knows – and it’s a very impressive piece of work. The opening act of Everybody Knows is rather intimidating, introducing the audience to an enormous ensemble of family members and friends that presumably the audience is supposed to commit to memory. Our nominal lead is Laura (Penelope Cruz), who is returning to her old hometown for a family wedding. She reunites with her father (Ramón Barea) and sisters, as well as old flame Paco (Javier Bardem) and his wife Bea (Bárbara Lennie). Laura’s husband Alejandro (Ricardo Darín) is away on business, but rushes over when their daughter Irene (Carla Campra) is kidnapped during the wedding reception. This unleashes a tightly plotted investigation, in which Farhadi’s script constantly toys with the audience’s emotions and loyalties. 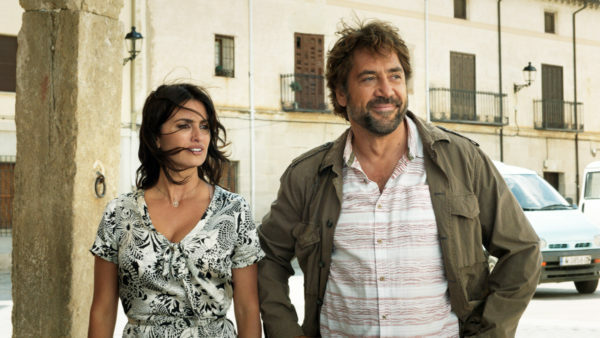 The second half of Everybody Knows plays out in a world of secrets, which unfurl with savage emotional impact. From the moment Lennie’s character makes the suggestion that “maybe it wasn’t a stranger” who was responsible for the kidnapping, she lights the fuse on a stick of dynamite placed right at the heart of this close-knit family unit. Cruz is on top form as a desperate mother, torn between the anguish of having lost her beloved daughter and the confusion she still has around her feelings for Bardem’s character. He, too, excels as a man who throws himself into investigating the kidnapping and physically seems to hold the worry and hurt within his hunched body, sparking questions about whether his own feelings for Laura are under control. When Alejandro flies over from Argentina in the wake of the crime, Paco is instantly suspicious of what he has been doing while all of this has taken place. This is very much a movie about suspicion and greed, as well as the amplification of those ideas when they are allowed to fester in the rehearsed politeness of family gatherings. When one character delivers the killer comment that “not talking about things doesn’t mean they’re resolved”, it betrays the fact that this family unit is far from the perfect dynasty it seems in the movie’s early stages. 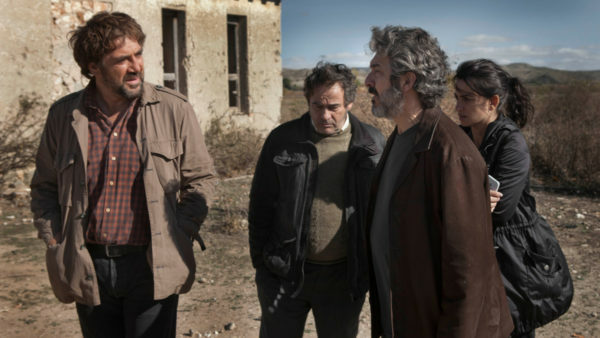 Farhadi contrasts the turmoil of the characters with the sun-dappled paradise of his movie’s small town environment – a confined, isolated world that incubates gossip and sows the seeds of mistrust. Everybody Knows could also be read as a critique of privilege, with the supposedly perfect family gradually broken down by Farhadi. Financial problems bubble to the surface, relationships crumble and resentments are revealed. This is a world in which suspicion is king and everyone has a few secrets they’re nursing. The actual resolution of the mystery is almost incidental, because the impact of what has happened on the central family is far more interesting and compelling. Lennie’s character, who sits somewhat outside the orbit of the central narrative, is an interesting person, portrayed with real complexity. On the one hand, she is deeply suspicious of how close her husband is with his ex-girlfriend’s family, and her constant warnings to Paco that he is “getting too involved” in the kidnapping mystery position her as a clear suspect. However, Lennie’s fiercely driven performance makes it equally possible to agree with everything the character says and sympathise with her predicament. 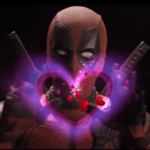 And that’s the overriding feeling when the credits roll on Everybody Knows – sympathy for these desperately flawed and unfailingly complex people. It’s a movie of Big melodrama – capital letter very much deliberate – with clanging bells and fluttering pigeons dominating the soundscape, while driving rain is deployed to create some overwrought atmosphere when things start to go south. However, it is also a carefully performed and elegantly crafted thriller about the poisonous power of secrets that delivers all of the answers the audience wants, while making it clear they’re less important than what’s going on inside the character’s muddled heads.